Chimeras on camera: Human neurons grafted onto a mouse brain migrate and grow over several hours. Neurons grown from human stem cells and grafted onto the brains of live mice mature and form connections like those in the fetal human brain, according to a new study1. Scientists could use the unusual setup to study the properties of neurons from people with brain conditions such as autism. The researchers reprogrammed human skin cells to an embryonic state and then coaxed them to form various types of brain cells, including neurons. They engineered viruses to deliver fluorescent markers into the neurons. They then transplanted the brain cells into the cerebral cortex, the outermost section of the brain, of adult mice. The transplanted cells integrate into the mouse brains and form a region that resembles an immature human cerebral cortex. The grafts contain proliferating cells as well as multiple types of neurons and glial cells. The cells are positioned within the graft like those in a fetal human cortex. The researchers used a technique called two-photon imaging to create time-lapse movies of single cells over seconds, hours and days. They repeated these sessions multiple times over four to six months. The images reveal neurons extending axons — long filaments that conduct electrical impulses — into brain tissue outside the graft. The neurons also form networks with other cells just as immature human neurons do — dynamically forming, losing and reforming connections. The transplants also have activity patterns similar to those in the developing human cortex. The researchers compared the transplants with similar ones from two people who have Down syndrome. 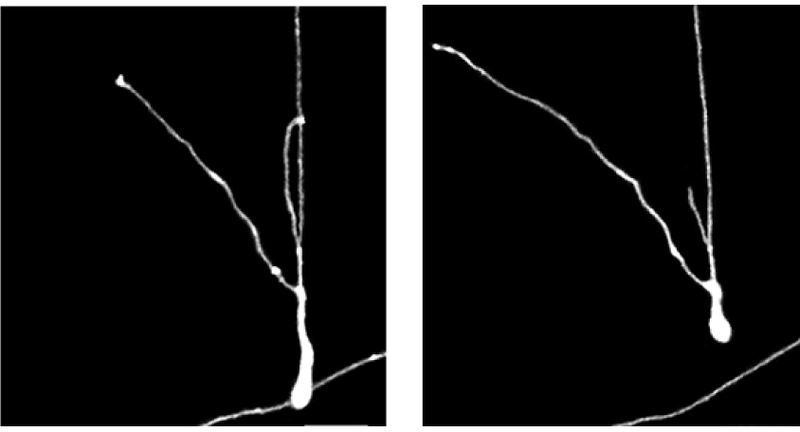 The Down syndrome grafts show diminished activity, and their synapses (neuronal junctions) are unusually stable, the researchers reported 16 November in Science. The researchers plan to assess the model’s relevance by comparing the architecture and cellular composition of the grafts to that of human fetal cortical tissue donated for research.